The MS3/07 is a replacement for the obsolete Intertechnik MS3; the new model comprises a Seas NoFerro 550 tweeter and a Seas WA 180 midrange / bass driver. "Contrary to my habits, I moved the listening session from my businesses premises to my lounge. This enabled me to put the speakers on the shelves of my wall unit. Due to my principle never to work in my private surroundings I don't even keep an amplifier and other hi-fi stuff there. So, I had to move my SAC components and Teac CD player as well while my usually understanding wife was watching my activities with censorious looks. After I promised to put the lounge into its original state after the session I first tried to find out how the bass responded to placing the speakers close to the wall. Ray Brown's and Laurindo Almeida's "Moonlight Serenade / Round About Midnight" coming from the old Bell CD was an obvious choice. Right from the start the picking of and gliding over the strings characterised the calm and collected Brazilian. And when his partner joined in stroking his bass fervently down to the lowest octaves, it became clear that even the slightest change in pressure of the bow stroke was reproduced as natural as I had expected. 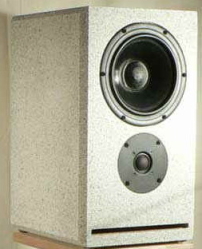 Boomy bass, often found when placing speakers close to the wall, was totally absent due to the gentle roll off below 100 Hz. The following rock and classical CD's only confirmed the initial impression. The small MS 3 impressed with attention to detail without being up front. Generally, this speaker is somehow reminiscent of polypropylene coned woofers, but are displaying lots of detail, more characteristic for paper cones. Finally, I enjoyed some female jazz, without too many instruments. Cassandra Wilson, Renee Olstead or Kitty Hoffy in German were all extremely convincing with their silky vocals, beautifully detached from the speakers and in full size. No hiss or booming disturbed the listening pleasure. The instruments took their fixed positions, surrounding the singing ladies and when Angela McCluskey presented "Don't Explain" encircled by cello and piano I knew that I had found another piece of music I like. Slightly melancholy, using deliberate minor chords and always spot-on in alternating vocal dynamics. And, getting back to the introductory remarks, they are certainly not dull. "